Wedding PR: AllSeated, Catersource, The Huffington Post, and more! This Monday, we’re serving up another great batch of client features, including AllSeated, Catersource, The Huffington Post, and so much more! Keep scrolling below to check it all out. 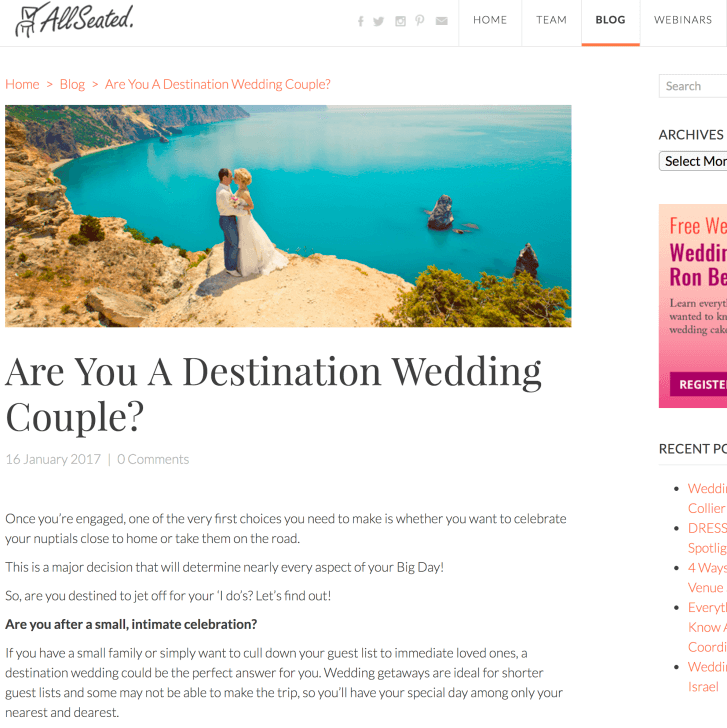 Destination Weddings Travel Group was featured on AllSeated with their article, Are You A Destination Wedding Couple? See the full article here. 100 Candles was featured on Catersource with their article, Tips for Memorable Tabletops. See the full article here. Wedding Academy Live was featured on The Huffington Post with their feature, International Wedding Trends for 2017. See the full feature here. Wedding Academy Live was featured on Top Wedding Sites with their feature, What’s Hot in Weddings in 2017–International Wedding Trend Report. See the full feature here. Wedding Academy Live was featured on I Do Take Two with their feature, What’s Trending in Weddings in 2017? See the full feature here. Magdalene Photography was featured on H&H Weddings with their feature, KC & Katie’s Elopement. See the full feature here. OFD Consulting was featured on Wedding Wire EDU with their article, What Are the Best Media Outlets for Me? See the full article here. Sunshower Photography was featured on Borrowed & Blue with their feature, Traditional Fête at Carmel Country Club. See the full feature here.